Legal practitioners in Texas continue to watch the scope of the Texas Citizens Participation Act extend beyond what they could have imagined. 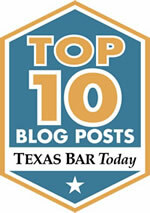 Texas enacted Anti-SLAPP legislation to curb litigants’ efforts to employ the judicial system as a means to silence or chill another’s First Amendment rights. The Texas Citizens Participation Act (TCPA) provides pretrial procedural checks against litigation designed to chill a party’s right to free speech, association, or right to petition government. See Tex. Civ. Prac. & Rem. Code §§ 27.001-011. The Act allows a party to file a motion to dismiss the case, with an award of attorney fees and costs to the party if successful on the motion. Courts construing Chapter 27 have applied its reach to both public and private communications, and beyond the obvious defamation claim to breach of contract, breach of fiduciary duty, negligence, gross negligence, malicious prosecution, false imprisonment, and other claims. See e.g., ExxonMobil Pipeline Co. v. Coleman, 512 S.W.3d 895 (Tex. 2017); Murphy USA, Inc. v. Rose, 2016 WL 5800263 (Tex. App.—Tyler Oct. 5, 2016, no pet. ); Kinney v. BCG Attorney Search, Inc., 2014 WL 1432012 (Tex. App.—Austin Apr. 11, 2014, pet. denied). Definitional constraints within Chapter 27 yield to the command that “[t]his chapter shall be construed liberally to effectuate its purpose and intent fully.” Tex. Civ. Prac. & Rem. Code § 27.011(b). One provision within Chapter 27 remains largely untapped, and will undoubtedly further broaden Chapter 27’s reach. The Act applies to a “legal action” that is based on, relates to, or is in response to a party’s exercise of one of the enumerated First Amendment Rights. The Act defines “legal action” as “a lawsuit, cause of action, petition, complaint, cross-claim, or counterclaim or any other judicial pleading or filing that requests legal or equitable relief.” Tex. Civ. Prac. & Rem. Code § 27.001(6). So the question is raised: what other judicial pleadings or filings, other than a petition, cross-claim, or counter-claim, fall within Chapter 27’s reach? The answer is in the definition: any filing or pleading that seeks legal or equitable relief and that is based on, relates to, or is in response to the party’s exercise of one of the enumerated First Amendment rights. Taking this definition seriously and without reservation could potentially wreak havoc in any specific case. Does Chapter 27 apply to a motion for sanctions under Texas Rule of Civil Procedure 13 or Chapter 10 of the Texas Civil Practice & Remedies Code? Maybe. After all, a Rule 13 and Chapter 10 motion for sanctions must relate to or be in response to something filed by the other party in the judicial proceeding, which implicates the initial filing party’s right to petition government. See Tex. Civ. Prac. & Rem. Code § 27.001(4)(A)(i) ("'Exercise of the right to petition' means any of the following: a communication in or pertaining to a judicial proceeding.”). If the party filing for sanctions seeks an award of attorney fees, that would be a request for legal or equitable relief, bringing the motion for sanctions within Chapter 27’s reach. Does Chapter 27 apply to a motion to dismiss under Texas Rule of Civil Procedure 91a? Maybe. A Rule 91a Motion to Dismiss is a judicial filing. The 91a Motion to Dismiss must be in response to the opposing party’s cause(s) of action alleged in a pleading or complaint. 91a mandatorily awards attorney fees to the prevailing party. And, filing a pleading or complaint clearly falls within the filing party’s right to petition government. (Note* Since 91a awards attorney fees to the prevailing party, an Anti-SLAPP motion to dismiss may not provide enough leverage to employ in response to a 91a motion, unless the party opposing the 91a motion wishes to have the option for an automatic interlocutory appeal.). Does Chapter 27 apply to a motion for summary judgment. No. A summary judgment hearing is considered a trial. So, even though a summary judgment is a judicial filing, and even if the motion for summary judgment explicitly seeks legal or equitable relief, Chapter 27 does not reach trials. Summary judgment motions themselves act as trial briefing with attendant trial evidence. The motions are necessary predicates to the summary trial. Chapter 27 by its plain language appears to reach most court filings seeking some form of legal or equitable relief, since in most, if not all, instances a filing seeking legal or equitable relief within the judicial proceeding will be based on, relate to, or be in response to the other party’s exercise of his, her, or its right to petition. Testing the metes and bounds of what constitutes a "legal action" for purposes of Chapter 27 is necessary to ensure that Anti-SLAPP motions do not take over judicial proceedings. The first place one might start to test the metes and bounds of the "legal action" definition would be a Chapter 27 motion to dismiss itself. Wouldn’t an Anti-SLAPP Motion to Dismiss itself constitute a judicial filing that seeks legal or equitable relief (an award of attorney fees) and that is in response to the non-movant’s exercise of his, her, or its right to petition government? Asked another way, could a party permissibly file, under Chapter 27, a motion to dismiss the other party’s Anti-SLAPP Motion to Dismiss? Or do we go too far in asking the latter question? After all, Chapter 27 creates its own safeguard against motions to dismiss which are “frivolous or solely intended to delay” by allowing the court to award attorney fees and court costs to the responding party. See Tex. Civ. Prac. & Rem. Code § 27.009(b). One might argue that the inclusion of this safeguard indicates that the legislature did not intend for Chapter 27 to reach a motion filed under the same Chapter. But nothing in Chapter 27 exempts Chapter 27 motions from the chapter’s reach. And, the stated purpose of the Texas Citizens Participation Act “is to encourage and safeguard the constitutional rights of persons to petition, speak freely, associate freely, and otherwise participate in government to the maximum extent permitted by law and, at the same time, protect the rights of a person to file meritorious lawsuits for demonstrable injury.” Tex. Civ. Prac. & Rem. Code § 27.002. Notice that the statute does not seek to safeguard only “Plaintiff’s rights” or only “Defendant’s rights” or only “Movant’s rights” or "Responding Party’s rights,” but seeks to safeguard the rights of persons, regardless of what side of the “v.” he, she, or it lands on, and regardless of whether he, she, or it is the movant or respondent. On the other hand, if a responding party as a defensive measure could use Chapter 27, the counter-Anti-SLAPP motion to dismiss would, arguably, effectively alter the burden of proof. A party filing a motion to dismiss under Chapter 27 bears the burden to prove by a preponderance of the evidence that the “legal action” is based on, relates to, or is in response to the party’s exercise of one of the enumerated First Amendment rights. Tex. Civ. Prac. & Rem. Code § 27.005(b). If this burden is met, then the responding party must establish “by clear and specific evidence a prima facie case for each essential element of the claim in question.” Tex. Civ. Prac. & Rem. Code § 27.005(c). The court must deny the movant's motion to dismiss if the respondent provides such clear and specific evidence. Consider, though, that by successfully providing clear and specific evidence to show a prima facie case of the claim, the respondant might argue that the movant could not supply clear and specific evidence showing a prima facie case for the relief sought in the initial motion to dismiss. And, if the respondent filed a counter-anti-SLAPP motion, the respondant might also argue that it was Plaintiff's burden to provide clear and specific evidence of a prima facie case for the relief sought in the initial motion to dismiss, so long as the respondant demonstrates by a preponderance of the evidence that the initial motion to dismiss was based on, related to, or was in response to the respondent's exercise of the right to petition government. Notice, however, that a counter-anti-SLAPP motion would essentially alter the burden of proof in Chapter 27. The initial movant need only demonstrate by a preponderance of the evidence that the legal action filed by the respondant is based on, related to, or is in response to the movant's exercise of one of the enumerated First Amendment rights. The movant does not bear the burden to demonstrate by clear and specific evidence that he, she, or it is entitled to the relief sought in the motion to dismiss--as an aside, Chapter 27 does place a clear and specific evidence burned of proof on a movant when the movant intends to rely on an affirmative defense to the underlying claims. What courts will do with the “legal action” language remains to be seen. Practitioners should consider tapping into this largely untapped area. Whenever an opposing party files a document with the court in which legal or equitable relief is sought against your client, consider employing Chapter 27.